Three White House cultural advisers have resigned in protest at the failure of US forces to prevent the looting of Iraq's national museum - home to artefacts dating back 10,000 years. 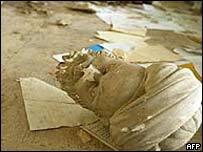 Priceless statues, manuscripts and other treasures were taken away in a wave of lawlessness following the collapse of the government of Saddam Hussein in Baghdad last week. "It didn't have to happen", Martin Sullivan - who chaired the President's Advisory Committee on Cultural Property for eight years - told Reuters news agency. "In a pre-emptive war that's the kind of thing you should have planned for," he said. In his letter of resignation, Mr Sullivan - who also heads a historic commission in Maryland - called the looting a "tragedy" and said many other Americans shared his feelings. His disquiet was echoed by Richard S Lanier and Gary Vikan of the 11-member committee composed of experts and professionals from the art world. According to the Associated Press, Mr Lanier - director of a New York foundation - attacked "the administration's total lack of sensitivity and forethought regarding the Iraq invasion and loss of cultural treasures". And Mr Vikan - director of Baltimore's Walters Art Museum - criticised the American failure to curb "what is now an open floodgate", the agency said. As well as the national museum in Baghdad, a museum in Mosul was looted and the capital's Islamic Library, which housed ancient manuscripts including one of the oldest surviving copies of the Koran, was ravaged by fire. The UN's cultural agency Unesco has called the loss and destruction already suffered as "a disaster". The US has pledged to recover and repair the items looted. Secretary of State Colin Powell said the Baghdad museum was "one of the great museums in the world" and that the US would take a leading role in restoring it. "Experts...believe the looters had inside help"